"PBC Guru has done a great job facilitating the Smith School Alumni book clubs! We’ve had hundreds of alumni sign up, with nearly 60% from out of state (including 9% international). 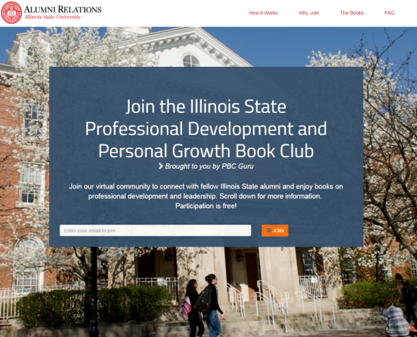 The book clubs have been very easy from a staffing standpoint – once up and running, PBC Guru do all the work. Their thought-provoking posts help jumpstart discussions and share valuable professional development tips with alumni." 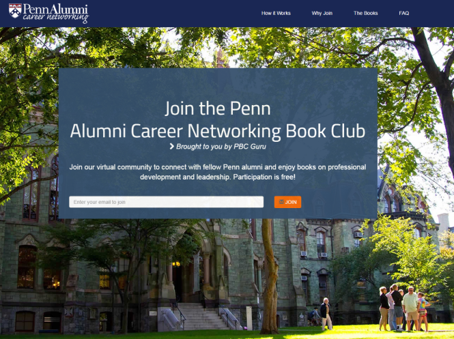 "Partnering with PBC Guru has given us the opportunity to expand our educational offerings and engage hundreds of Penn alumni in a quality learning experience. 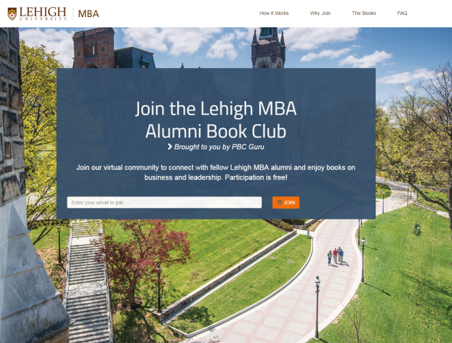 The leadership at PBC Guru has included us and solicited our feedback in every aspect of planning, ensuring that we can make our book clubs feel like Penn Alumni activities without taxing our staff resources with the day-to-day program implementation and supervision." 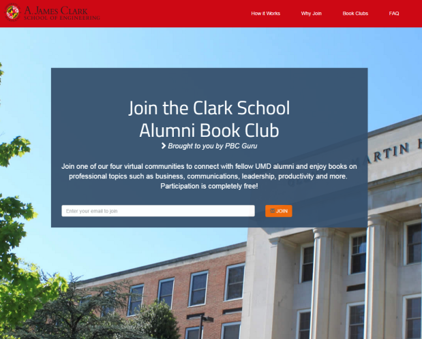 These numbers are based on a virtual book club program at the University of Maryland with more than 200 alumni participants from an alumni population of 20,000. Similar outcomes have been realized with many other University programs. 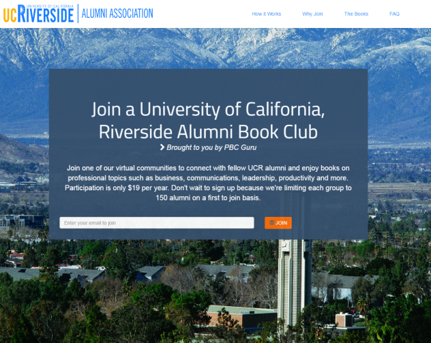 We manage nearly every aspect of the book club so your alumni connect to the University without draining your limited staff time. We work with you to define the goals for your program based on your needs and our experience working with Universities. Based on your goals, we’ll help you decide how many book clubs you need and who should be invited to each one. Alumni participate online when it’s convenient for them rather than needing be available at a specific time.